Thanks to Gurus for sponsoring today’s discussion. Being more sustainable in every day is so important to my family. Being that we live in an apartment, my off-the-grid-gal is screaming for ways I could be sustainable if only we had our own place, but that doesn’t stop me from trying to do what I can to live a more green lifestyle when I can. If you are looking for more ways to be sustainable in the upcoming heat of summer, here are 7 ways to be more sustainable this summer. Drink more tap water. One of my biggest beefs with packaging is plastic water bottles. I cringe when I have to buy one because I forgot my reusable bottle with me. I make an effort to use it at least 1 more time before getting rid of it and I look for the kinds of plastic that can be recycled. If you drink more tap water, you won’t have a need to buy water bottles. Wear sustainable footwear. In the summer, we often but cheap plastic or foam flip flips to wear for the season, but these are simply not a sustainable option. Look for ones made of natural rubber such as the ones from Gurus. I was curious about them and was recently sent a pair to try out and I absolutely love them. They are made from sustainably sourced natural rubber and they even plant a tree when you buy a pair. Plus, you can’t beat the unique India-inspired design. If you are wondering about the design and how comfortable they are, my answer is a YES! They are actually very comfortable. I would say more so than traditional “flipflops”.Scroll to the bottom of this post if you want to win a pair! You can also use the code savedbygrace at the checkout and get 15% off your order! Hang-dry your clothes. Skip the dryer and go outside to line dry your clothing if you can. Not only will you save energy from not running your dryer, but you won’t heat your house up causing your air conditioner to work overtime and your clothes will smell amazing! Shop local farmer’s markets. If you are lucky enough to live in an area that has farmer’s markets, shop them for the best local stuff. You will be supporting local business and making sure to get stuff that doesn’t have to shipped, packed and refrigerated for 100’s of miles. Skip Styrofoam and plastic at picnics. When people go for picnics it is very common and let’s face it, convenient, to use throw away utensils and plates. This creates huge amounts of waste each summer! Although it may be just a bit more trouble, use ceramic or bamboo plates. You can give them a quick rinse before packing them away to be taken home and washed. Travel in energy efficient rental cars rather than flying. Did you know you can rent hybrid cars? Well, you can and driving may not seem like the green thing to do, but traveling by car (even a regular furl style one) saves fuel and Co2 emissions when compared to flying. Walk more for shorter distances. If the place you are going to is less than a mile away, there is really no need to get in the car and drive there unless you have a physical reason you can’t. Walking is better not only for your health, but also your wallet when you consider the cost of fuel and parking in many areas. 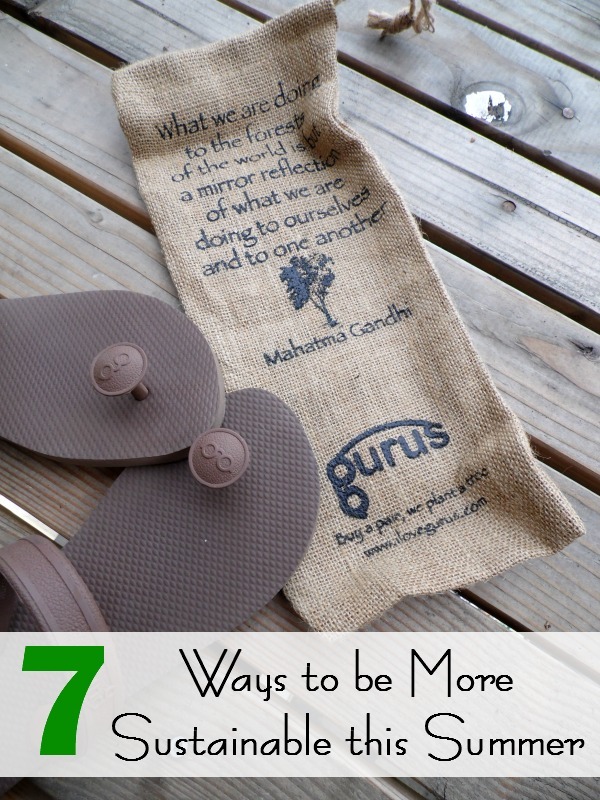 Would you like to win a pair of Gurus for yourself? Here’s your chance! Just enter below until 4/10/2015 when one winner will be chosen. We grow our vegetables and some of our fruits. Also, we try to turn our air conditioning off as often as possible, especially during the evenings. We do what we can but we are still a work in progress! Doing what you can is the best thing anyone can do, Heather. I always try to stress that it oisn’t a race to see who can be the most green, but a process of adopting what its into your life and making it work. All steps help! I love these ideas! We love the local farmer’s market and these shoes look so cute and comfy! Jo recently posted..FREE KIDS CLOTHES!!!! They really are super comfy and I have gotten many compliments from other about my Gurus! I can’t wait to stroll the farmer’s markets here in them! I’m constantly carrying around my water bottles filled from home. I leave the beach cleaner than I found it. Composting and growing our own garden! I hang out clothes, use tap water, and grow some of our own food. We grow a garden every spring/summer and I line dry a lot in the summer (especially cloth diapers, towels and bed sheets). Additionally, we’ve started composting as well. We already reuse, recyclye and repurpose as much as possible. We also enjoy going to the local farmer’s market and purchasing our food there. There are several ways I live a more sustainable life. In the summer I walk or bike as much as possible and try not to drive my car. By not driving I am reducing carbon emissions and supporting sustainability. I reuse the same drinking cup and drink tap water and never buy plastic bottles. 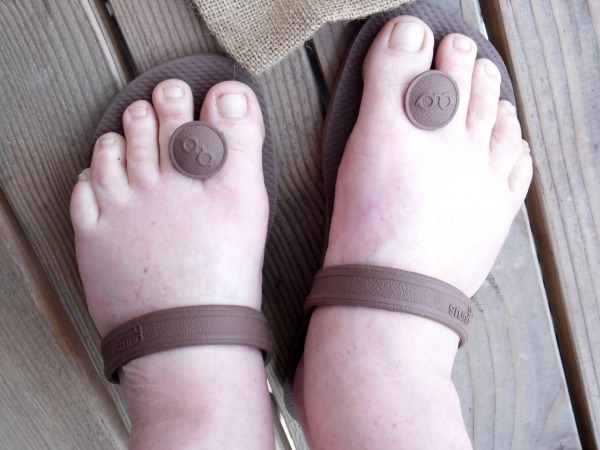 I would love to win a pair of the Gurus sandals and never using rubber or foam again, making flip-flops a thing of the past. We re-purpose plastic bags and packaging and use reusable when shopping. We shop at Farmer’s Markets. We grow a small garden, hunt mushrooms, pick blackberries and hang our clothes out to dry instead of using the dryer. We also use rain water for gardening. Those are all great ways to be more sustainable in the summer, Dawn! I have trees around my house to provide shade and wind protection. I rarely have to use my air conditioner.